Playing dance and rock favorites from yesterday to today! The Kickbax is a fun-loving and more-than-entertaining band hailing from the Philadelphia area. The lineup consists of a rock solid rhythm section that includes the high-energy Rich on drums, and Ted, the multifaceted and sarcastic bassist/keyboardist. Lead guitarist Kevin is unmatched at recreating the sounds of all the hits from the 60s to today's contemporary hits. Whether being fronted by their beautiful and energetic female vocalists Kathy or Amy, you're sure to be entertained and included in the fun and mayhem of this rockin', dancin', tight-knit entertainment powerhouse. All members trade off vocal duties, which sets them apart from your typical cover band. 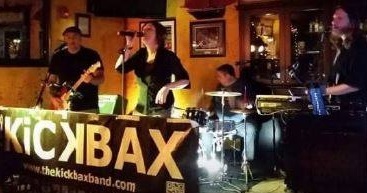 The Kickbax plays regularly at well-known local taverns and clubs such as DaVinci's Pub in Collegeville, Irish Rover Station House in Levittown, The Buck Hotel in Feasterville, and Molly MaGuires in Phoenixville. The Kickbax are also available for private parties for any occasion! For more information or for gig bookings, please contact Kevin at thekickbaxband@yahoo.com.